The Olhos de Agua beach is just made for those who love running, especially in the wee hours when it is generally empty. Fishing boats mark one end of this exquisite beach, as pristine in the day as it is beautiful by night. The waters are inviting and clear, shallow enough for some idle frolicking a fair distance from the shore. Another reason this is a great beach for families as there are a lot of rock pools. A short walk away around the cliffs leads you to one of the most stunning beaches in the Algarve, Praia De Falesia - perfect for an early morning stroll! Sunbeds are very reasonable to hire at 15 euros for 2 beds and a canopy all day. There is also a dedicated area for parasols! There are lots of shops, cafes and bars along the beach to browsethrough. 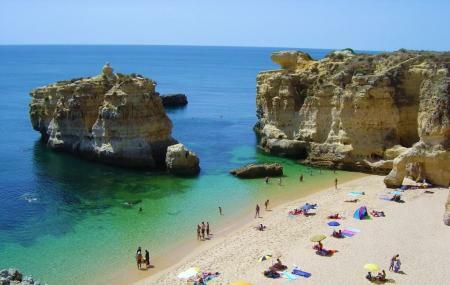 How popular is Olhos De Agua Beach? People normally club together Praia Da Falesia and Albufeira Riding Centre while planning their visit to Olhos De Agua Beach.